A contingent of five spartan SPARTANS gathered at SJCC to catch the 7am Uber-Hauler-Spartan-Mobile as Art Tahoed us up to San Rafael for the John Larson 4.2m Tamalpa XC Challenge. To pass the time, the SPARTAN Super-Seniors thought of singing “100 Bottles of Beer on the Wall” in remembrance of Judge Kavanaugh, but soon slipped into their usual stream of ribbing bandinage until arriving at China Camp State Park along the calm waters of the San Pablo Bay. It was another cool, sun-kissed day as 117 Masters toed the line. In addition to the SPARTAN five, there were many other familiar faces in the aging crowd, like veteran harriers Bill Dodson (83 yrs, 53:22) and Elmo Shropshire (81 yrs, 42:04) and senior harrier Julios Ratti (68yrs, 38:48). 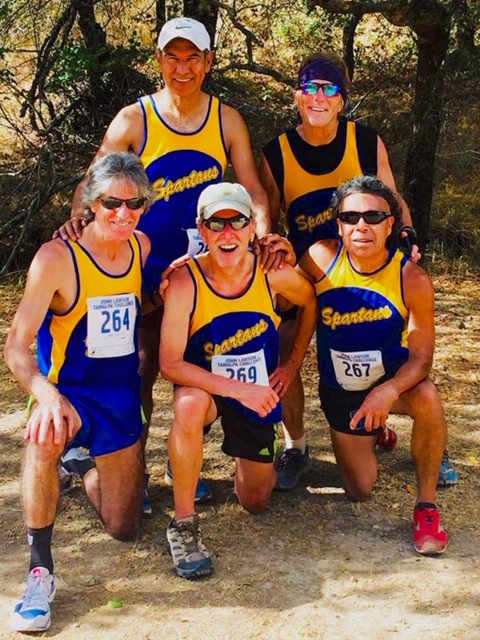 In addition, it was great to see former SPARTANS Norm Cornwell (69yrs, 36:09, now with SC Slugs) and Jeff Hongo (53yrs, 26:27, now with Hoka Aggies) as well as SPARTAN wannabe Bill Brusher (67yrs, 35:32). This race has long been dedicated to the memory of Tamalpa runner John Larson, and the Larson family has provided post-race engraved beer mugs and beer to the registered harriers for many years. John Larson’s son was at the starting line to give a short, poignant reminder of his father’s legacy, inspiring a heartfelt round of applause before the race began . The China Camp course is a beautiful fire-trail and up-and-down single-track rolling romp through the wooded hills above the bay. The course is not without, what Kurt calls, the “Three Rs” of hazardous cross country trails: roots, rocks, and ruts; however, although the course demands your attention, it’s a true cross country challenge and rollicking good fun along a Le Mans type course. Brian made it to the starting line (on time!) which greatly improved his start as he led the SPARTANS with a an impressive 32:49. Art is showing continuing strength and closed nicely with a 38:11. Nick is contributing greatly to the SPARTAN season this year and scored for the team as he cruised the course in 39:29. Kurt is continuing his g-r-a-d-u-a-l comeback covering the course in 42:45 ahead of another wounded-but-recovering Sal in 43:14. Will Geiken (Hoka Aggies) took top honors in the Open Run with a 21:13 (! ), and Jaime Heilpern (Hoka Aggies) took the Masters field with a 23:32. Teresa McWalters (Impala) was the top woman, covering the same course in 24:50 (!). The top senior was West Valley’s Clay Bullwinkle (61yrs, 27:01). How the SPARTAN senior team will fair in the final tally is yet to be determined, but Tamalpa looks unbeatable on their home course finishing 2, 3, 4, with five of their runners finishing in sequence (3, 4, 5, 6, 7)) within 30 seconds! (29:44––30:16). Hats off to Tamalpa . . . . The SPARTAN five decided not to take a Don Larson commemorative mug this year. Having run the race for so many years, each has a complete, unused set of 12 crowding the upper shelves of their kitchen cabinets. And it seems SPARTAN wives are more impressed with medals than beer mugs. Tell that to Judge Kavanaugh . . . .